My OUTLANDER Purgatory: Echo Excerpt in Outlander: WTF??? Echo Excerpt in Outlander: WTF??? I finished the book. I started reading the excerpt from the next book. Who the heck is having a baby with 2 fathers???? And where is Ellen cause it keeps saying Ian. And where are they???? Now... I'm not really sure WHY she's asking about Ellen. Does she mean Jenny? Ugh - whatevs. Anyway - whoever signed off on putting an Echo excerpt at the end of ANYTHING OTHER THAN A BREATH OF SNOW AND ASHES should have a SERIOUS talking-to by his or her boss. Just out of curiosity...what edition of OUTLANDER is that? The US edition (blue cover)? Mass-market (small size) or trade (large size) paperback? I agree with you, that's a huge and bewildering spoiler to throw at a newcomer to the series!! P.S. Your SISTER? You mean there's another one?? How has she managed to hold out this long without either you or Tracey addicting her already? Jill will henceforth be known as Third Sister Jill. :-) LOL, Carol and I have been doing our best to get her into the series--it doesna help that she's a careful (read: slow) reader or that she claims she never has time to read. But never fear...we got her through all four Twilights and we will get her through this, too!! 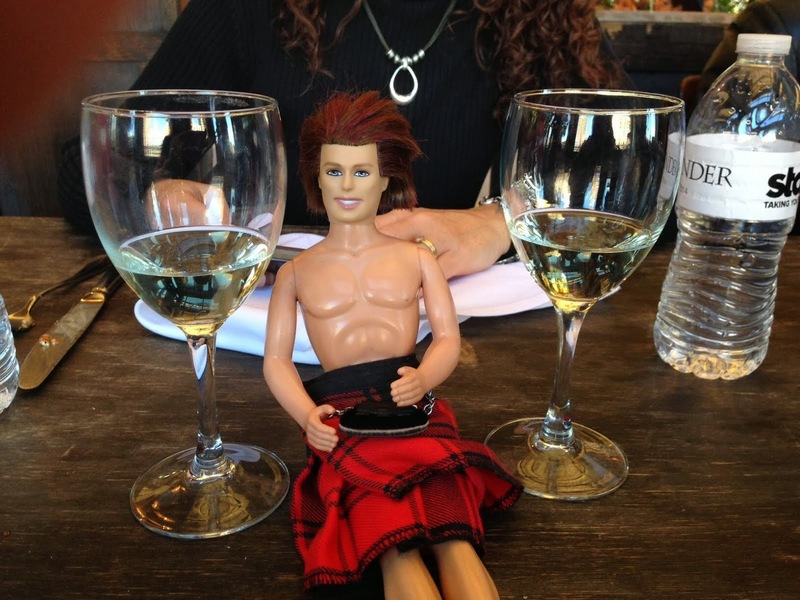 Funny story re: Jill--last time all three of us hung out, Jill had just finished the Jamie/Claire beating. She was all, "you guys, I don't know if I can take much more of this! All the violence! If it's gets any worse, I don't know if I can go on!" And Carol and I just look at each other and go, "Ummmmm....." But she kept reading--yay! Just purchased a copy of Outlander to share with a friend (or two, or more...) since I'm a Kindle reader. This edition DOES have an Echo excerpt in the back. [Blue cover, paperback]. I dinna know what the publisher was thinking! Karen - good question - I think she's reading the larger blue paperback. (Hell I may have bought it for her; canna remember.) And the fact that she isn't addicted is nothing less than a TRAVESTY!! I dinna get it and willna ever understand how she can be a sister of Tracey's and mine - and not be babbling the word "Jamie" over and over again in her sleep.. after reading Outlander. But... such is life, I suppose. While we're on the subject of annoying publishing things--can we get rid of ALL back cover copy (except, of course, the various reviews praising HERSELF)? If you look at Dragonfly's back cover, for example, you're sunk before you've even started!! Carol - nah, I don't think she'd roll her eyes at you or anything. It's a reasonable question. (Though I suspect the answer could be something like, "Complain to Random House [or whoever], I don't have any control over the excerpts they put in the OUTLANDER paperback." I'm curious, too, to see what she has to say. I don't think she'll bite your head off for asking. But if you want to catch her in a good mood (just in case), wait till she gets back from Scotland in a few days. Hahahahahaha How did you manage to keep a straight face when she asked if there was more violence?? The Jamie/Claire beating was just foreplay!! Oh, my golly! Had I had your email addie I would have been emailing you in the wee hours of the morning. I have been finishing up Snow and Ashes. Things were just plodding along and then, BAM! all H-E-double toothpicks broke loose! Don't want to give too much away, but I'm not sure I can start Echo quickly enough! WOW! Oh, and yeah, whose idea was THAT to put a preview from a book on down the line? Dumb. I'm just sayin'. AG--Best acting I've ever done. :-) I think I actually have a video from that night out--actually, I have several, as it was the night our cousin JennD was in town and we all went out--but I definitely have one of Jill giving her opinion that I may have to put up on YouTube. I think Carol or Tracey should be the ones to ask this question. I don't mind passing on questions for folks who don't have Compuserve accounts or are too shy to ask questions of Diana directly, but neither of those applies to you, since both of you have posted there before. sanderson11: ROFLMAO!!! That is brills--how did Carol and I not think of that???? I must confess.... I didn't get anything about it after Outlander, but now that I just finished The Fiery Cross Ikeep going back to the excerpt and guessing whats going to happen.... So, before Ian came back, I knew that he was going to come back. I know, i'm a bad person!!! But I get joy out of getting hints of what's going to happen. So yeah. And I know that Jamie and Claire live through the burning of the house. I agree, whoever put that there needs to have a serious talking to. I just gave copies of Outlander to 2 friends of mine (both of whom are loving it, btw :-) I made sure to tell them _not_ to read the excerpt from Echo in the back and _not_ to read the back cover of _any_ of the books until they had finished the previous book! Darn spoilers! Carol, did you get my email? I sent you a new story. This one is about Roger. Read it! Sanderson11 - DY. ING. That RULES. Even moreso if you're a True Blood fan. Miranda - I got your email but no story! I was waiting for you to send it! L - omg I would have FREAKED OUT. MUST be a man. The My Outlander Purgatory Shop! Book 8 Ponderings - Post Scriptum! Diana, What Have you Done to me?! The Third Sister Finishes Outlander!